Colloidal silver is a powerful antibacterial solution consisting of minute silver particles suspended in a liquid solution. As a known microbial antibiotic, silver has been used across the globe as a topical and internal medication for decades. Ever heard the expression "born with a silver spoon in his mouth?" This dates back to the 1800s when the English aristocracy would feed their children with silver cutlery to ensure better health; however, following the discovery of penicillin in the 1940s and subsequent increase in commercially prepared antibiotics, the medicinal value of colloidal silver was discounted. Currently there is limited acceptance for the use of colloidal silver in bandages; but it remains a controversial alternative that is often shunned by the mainstream health system. Unlike antibiotics, which only work on bacterial infections, colloidal silver is a broad spectrum antimicrobial so that it works against not only bacteria, but also viruses and even fungus! All it takes is a 5 minute search on google to find a huge number of positive testimonials backing up the use of this amazing remedy that is not only cheap but also extremely simple to apply. How Does Colloidal Silver Help? Ear infections can occur in the more external ear canal or in the inner ear called the middle ear. They are caused by mucus build up in the space normally filled with air. This mucus can then become infected. Also the skin of the ear canal can become irritated and inflamed and thus become infected by bacteria but also by fungus. This can happen at any time and sometimes for no apparent reason. People who swim a lot and people prone to allergies are more likely to develop an infection but it can happen as a part of the common cold. An infection can cause pain (due to pressure build up) and some temporary hearing loss. Sometimes ear infections pass on their own after about 3 days but if not, some treatment may be required. 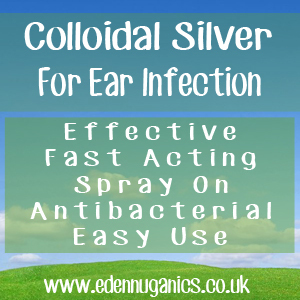 Colloidal silver replaces the use of antibiotics that may be prescribed if the ear infection does not pass after 2-3 days. Happily, it is also an antifungal as well, so it can treat any fungal infection that may be present in the skin of the ear canal as well. Lie with the affected ear upwards. Put several drops into the ear and lie in this position for 1-2 minutes. Press the cartilage at the front of the ear canal a few times to push the drops deep inside the ear canal. It's a good idea to lay on your side with your infected ear facing down, allowing any excess moisture to drain out your ear naturally. This can be repeated up to 3 times a day until symptoms start to improve. It may take around a week for the infection to clear up completely. Other Natural Remedies for Ear Infection? Salt is probably the most readily available and simple home remedy when treating an ear infection. Salt Therapy helps to treat all four major processes acting on the bronchi: inflammation, excessive mucus, spasm (bronchospasm), and hyperactivity. The first thing to do is to heat approximately 1 cup of salt in a pan. Any salt will do; however, for maximum effect we recommend pink Himalayan salt. Next we need to add the salt to a thick clean sock or similar item. Be sure to seal the open end with a rubber band or tie a knot. Once it has cooled to a bearable temperature, lay down on your side and apply the salt compress to the affected ear for around 10 minutes. Repeat this treatment up to four times a day. The heat generated from the sock will help draw out fluid from the ear as well as relieve swelling and pain. Garlic is packed full of powerful antimicrobial properties as well as being a natural pain reliever making it highly effective in the treatment of ear infections. There are a few ways to use garlic as a home treatment. Garlic oil can be made by cooking two garlic cloves in two tablespoons of sesame oil or mustard oil until it turns blackish. Strain the solution and wait for it to cool. Next simply add around two drops of the oil to the infected ear. Another great way to use this highly therapeutic bulb is to boil two or three fresh garlic cloves in water for five minutes, then crush them and add some salt. Put the mixture in a clean cloth and place it against the affected ear. To get rid of the fungus as well as the ear bacteria that may be causing the ear infection, apple cider vinegar is a very good option. This natural health elixir is one of the most popular home remedies for this and with good reason. ACV possesses antibacterial, antifungal and antiviral properties that have proven time and again to be effective against a huge range of bacterial infections and other health issues. The first thing to do is mix one part apple cider vinegar with an equal amount of distilled water. Soak a cotton ball in your ACV and water solution. Apply the cotton ball to your ear like a plug and leave it for about five minutes. This can be repeated twice a day until symptoms improve. Silver For Ear Infections & More!